Summer’s Over, but Ice Cream’s Not. Summer is over and I made my last batch of ice cream for the summer. Hahahahahaha…yeah right. Most people relate ice cream to summer time. I actually love ice cream in the winter on a cold day. So just because summer has ended, I will still enjoy my ice cream. Especially home made ice cream. Especially Orange Chocolate Chip ice cream. Oh yeahhhhhhhhhhh. Chocolate and orange go very well together. If you follow my blog, you know how much I like my orange. Awhile back I posted an orange chocolate chip cookie recipe. Amazing. I got to thinking how good the same combo would be in an ice cream! I’m smart like that. Ha! 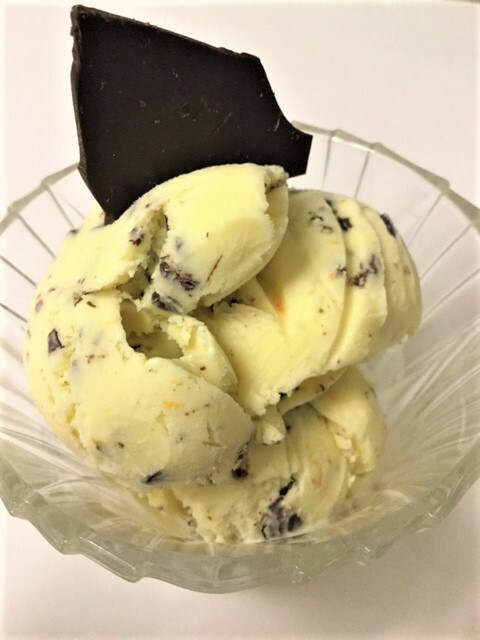 I used my go-to base ice cream recipe……added some orange zest and some grated chocolate. A good quality chocolate is best. I used a Lindt Chocolate candy bar. 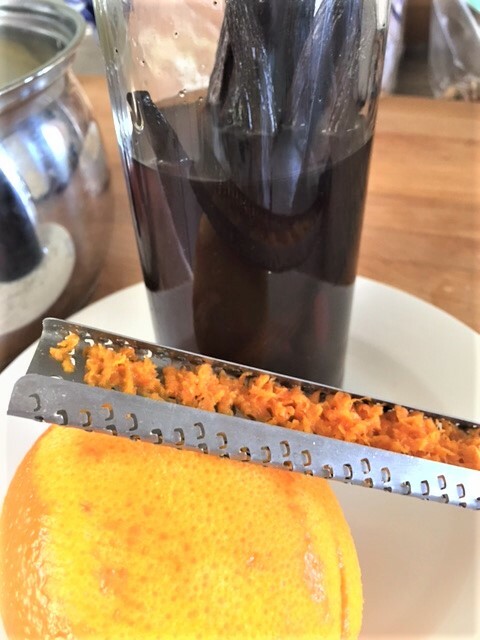 Keep in mind, orange zest is strong, so if you only want a hint of orange flavor, use less orange zest. Don’t wait till next summer to make this. I think you should make it soon! In a large bowl, mix together the egg yolks and sugar together. Set aside. In a sauce pan, heat 1 cup of the heavy cream, the milk and the half and half, just until it starts to bubble. Remove from heat. Scoop out 1/2 cup of the hot liquid into the yolks and sugar, whisking quickly so your eggs don’t scramble. Pour that mixture back into the sauce pan and return to the heat. Stir constantly, for about 4 minutes or until slightly thickened. It wont be real thick. 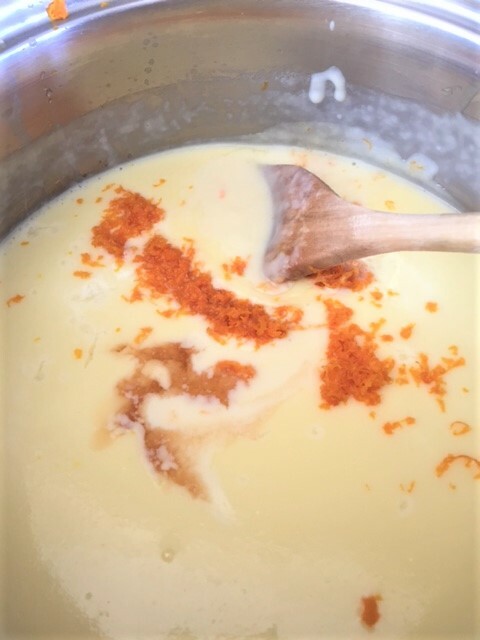 Remove from heat and stir in the orange zest and vanilla. Allow to come to room temperature. Cover and allow to completely chill in the refrigerator for at least 5 hours. Over night is better. Once completely chilled, stir the remaining cup of heavy cream into the mixture. Pour into your ice cream maker. Follow the instructions of your ice cream maker. I have a Krups and it takes about 20 minutes to churn. 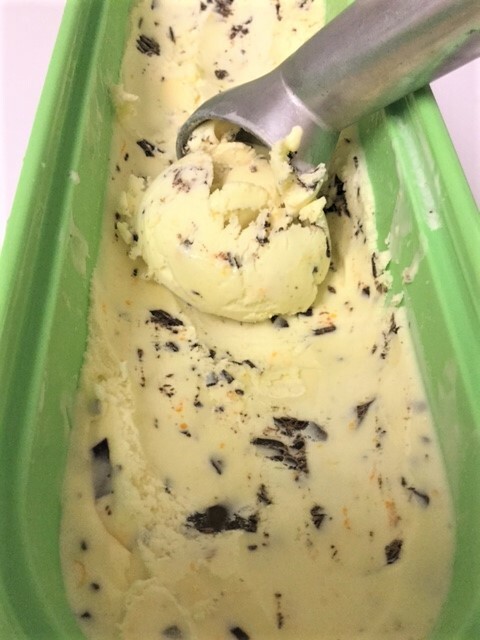 Transfer ice cream to an ice cream container and stir in the chocolate pieces. Freeze. But ya gotta taste it first, while it’s still soft! So good.